Yes you can eat beet leaves and guess what… they are good for you too. The other week I shared with all of you my mom’s creamy beet crunch recipe which is a great way of using beetroot rather than pickling them. Now that the Fall season is in full-swing you will find beets in just about any grocery store for a decent price. Do you remember how I mentioned that you could use the beet leaves? I’ve taken simple beet leaves which most people would toss in the bin and turned them into a great stir fry with lots of yummy vegetables. This is an ideal pairing with the beet crunch. I really do like experimenting and knowing that you could use the entire beet including the beet leaves is great, no waste! I dislike creating food waste and if I can use every last piece of my vegetable or fruit I will. I even found out that you can dehydrate your tomato skins to make a powder to enhance you dishes. How to use beet leaves? You can use beet leaves in a smoothie, beet leaves salad or in a stir fry like I’ve created today. 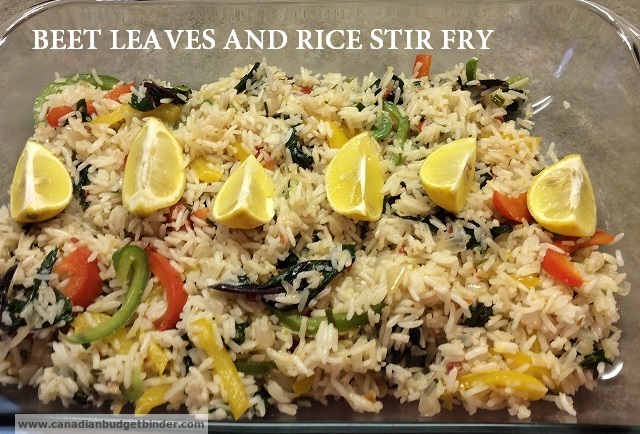 You could put the beet leaves into any stir fry but I had rice and peppers to use up so it was an ideal way to use up the contents in the refrigerator. My kids are used to trying new food creations and two out of the three gave this beet leaves and rice stir fry a thumbs up. I think Rhia is still trying to find her taste-buds. Beet leaves also known as beet greens are very nutritious and a great alternative to other greens such as spinach, rapini and Swiss chard. If you are a lover of smoothies don’t miss the opportunity to use beet leaves in place of other greens you might typically use. According to Incredible Smoothies just 2 cups of beet leaves equals 2 grams of protein and only 17 calories and contain all the essential amino acids. Two cups provide up to 160% RDA of vitamin A (as beta-carotene), 25% RDA of vitamin C, 253% RDA of vitamin K and 8% RDA of vitamin E. They also contain small amounts of all B-vitamins (except for B12). When it comes to minerals, two cups of beet greens provide 89 milligrams of calcium (9% RDA), 2 milligrams of iron, 16% RDA of copper, 13% RDA each of magnesium and manganese, 12% RDA of potassium and 11% RDA of sodium. Beetroot leaves are a great source of nutrients and instead of throwing them in the compost try using them in this delicious, fast side dish. Now add peppers, herbs and any other vegetables you wish. Drain rice and rinse under cool water to stop cooking process and add to the pan. Cook peppers until they start going soft. Finally add your beet leaves at the end and let the steam wilt them. When cooked they will be wilted a lot like spinach or Swiss chard. There you have it a simple beet leaves stir fry that can be added to or just served up with lemon quarters for that bit of extra zing! How do you use your beet leaves? Find Me on Social Media such as Facebook, Twitter, Google + and Pinterest by clicking on the links below. What a great idea! My friend makes these awesome dumpling things that are wrapped in beat leaves; it’s a Ukrainian recipe, I think. She got it from her MIL in Saskatchewan. Delicious.